This photo, taken a few days ago after the piles of leaves raked along the curbs had been collected, shows the tulip poplars that line my street. In every season they are messy trees. If these trees were people they would be very messy teenagers (I love teenagers, but most of them have not mastered “cause and effect”): tulip poplars deposit large, sticky, green, cream and orange tulip-like flowers in the spring; twist-your-ankle seed cones with pointy needle-like cores in the summer; thick, heavy leaves in the fall; and large branches with every wind event. 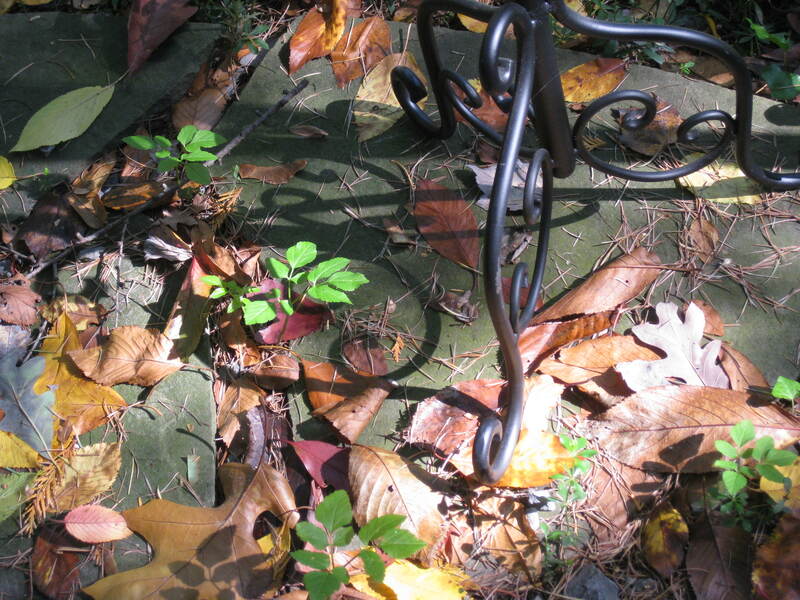 And yet, for a few days in the fall, when the golden leaves are mostly still on the trees and enough leaves have fallen to line the curbs and the afternoon sun shines along the street, I can understand why someone planted so many of them on our block. The profusion of radiant, translucent yellow is like a symphony for the eyes. And yet, since everything in life is a trade-off, the symphony comes at a price: we are expecting a heavy, wet snow tomorrow. Wet snow on branches still laden with leaves is scary when you live in a neighborhood graced with giant old trees. 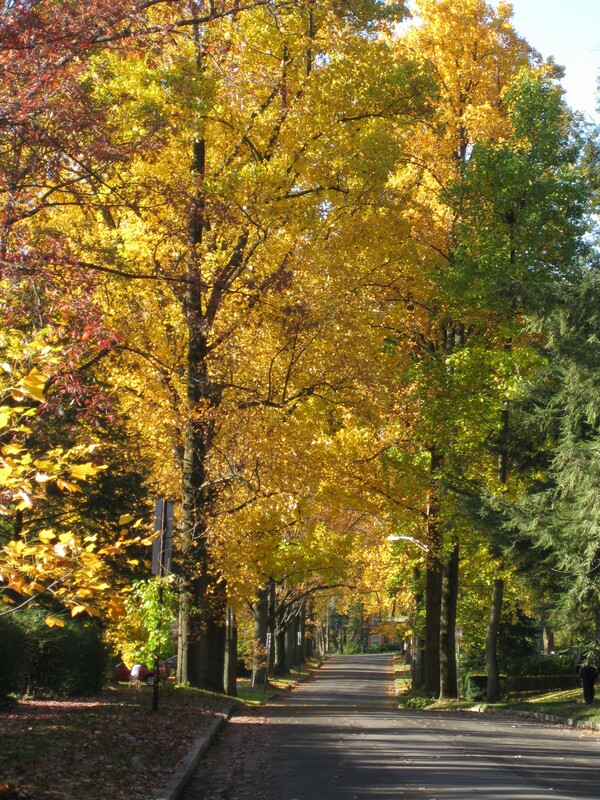 We hope for the best, for our neighborhood and for the tulip poplars. The new (six months old is new!) 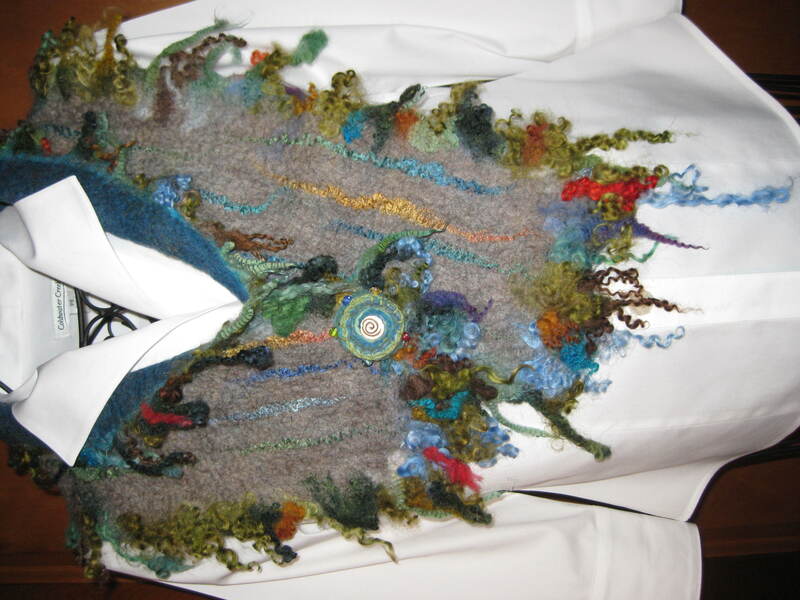 online publication, “Spin Artiste,” a labor of love created by fiber artist Arlene Ciroula, expresses everything wonderful about fiber arts. 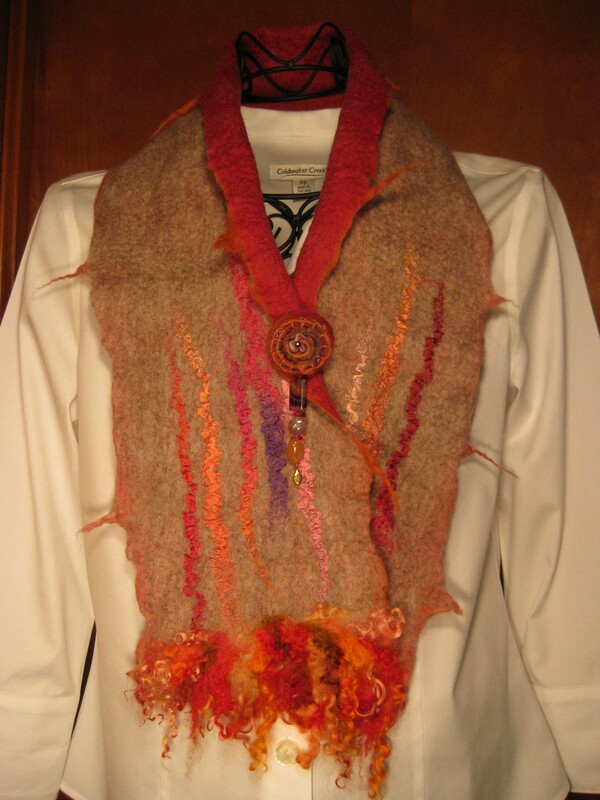 Today’s article and photos, about “Spun Monkey” fiber artist Shannon Herrick, is so uplifting and beautiful. 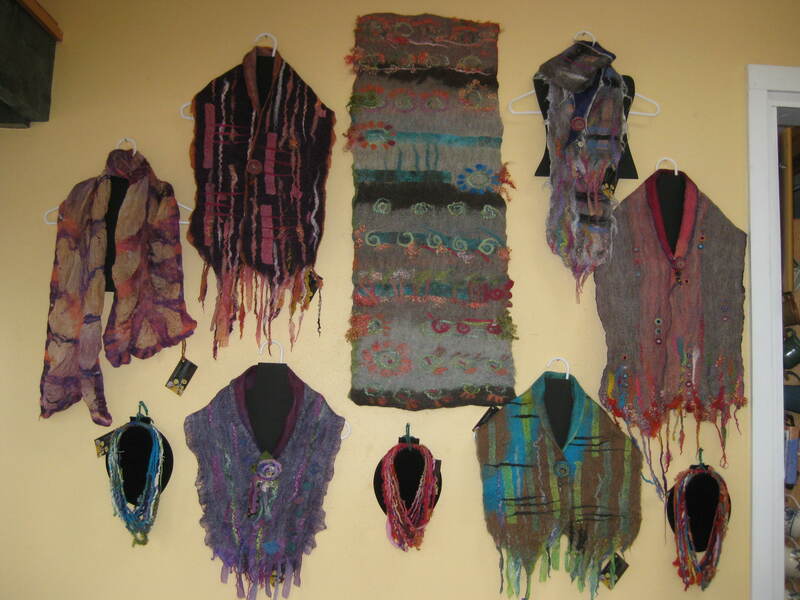 I bet that even those who are NOT fiber artists will feel deeply inspired by the creativity and joy available via Spin Artiste! It is one of those antidotes, a tonic to balance whatever is dreary, confounding, disappointing. Spin Artiste brings me home to abundance and positive possibility. And… it’s free and available 24/7. There is a Jewish teaching that the reward for doing a “mitzvah” (good deed, the plural of which is “mitzvot”) is the inclination to do another good deed; and the punishment for doing evil is the inclination to do more evil. So it is with doing work that one loves: the more you do, the more you are excited about your work! Such a beautiful time of year in central Pennsylvania. Yesterday, while taking some photos of new work, outside on the patio, I noticed that right at my feet, under the wrought iron legs of my dress form mannequin on which I arrange scarves to photograph, was a color combination that could occupy me for a long time in the studio! 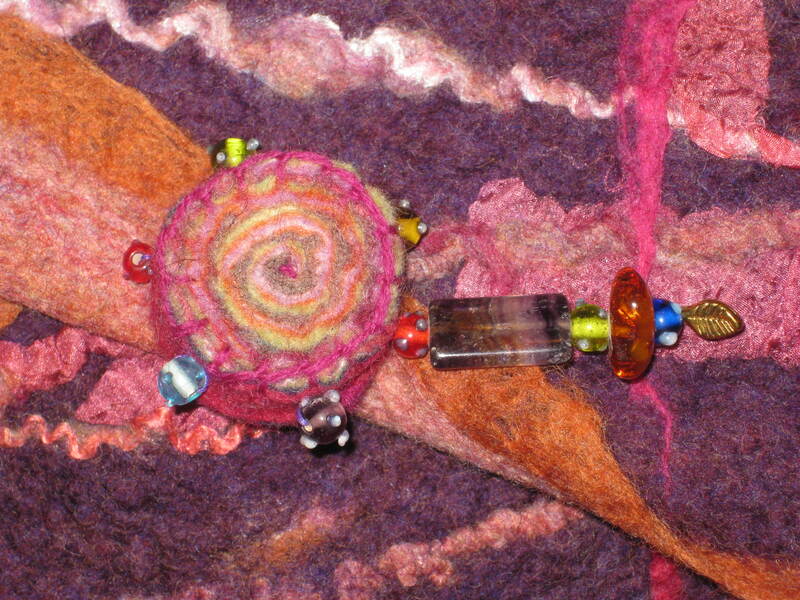 Here are a few images that share some recent work as well as the rolls of dots to be cut and some yarn I hand spun from the same fibers as I used to fabricate the dots ( I used the leftover fibers from making the dots, and added some mohair curly locks and some hand dyed silk fabric strips to spin the yarn). 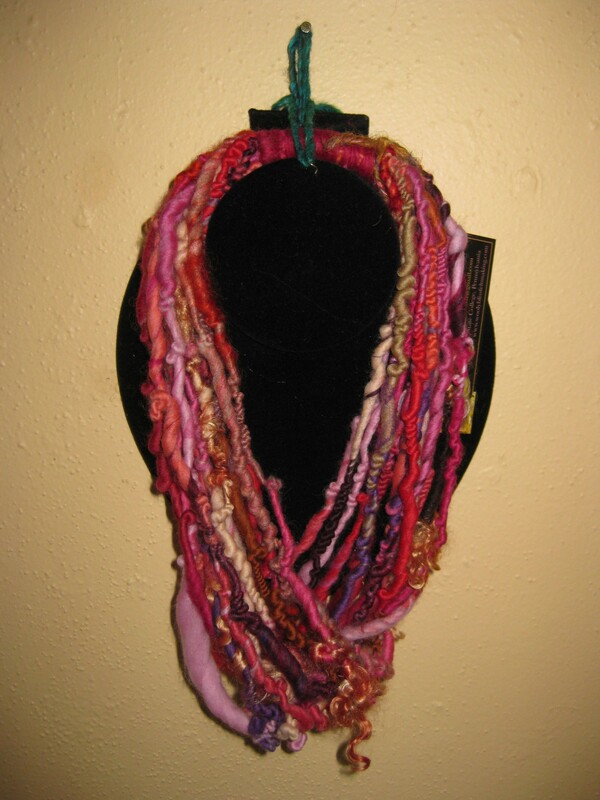 I’ll be working on some “Bliss” scarves today, using the dots and yarn and adding more curly locks. Change is hard. It seems to me that in order to fundamentally change some aspect of one’s own patterns of behavior, one needs to change — or at least tweak — just about every behavior. Even if one cannot “have it all” in life, I’d love to believe one can have some taste of “all” that one longs to have or experience. In artmaking, we’re guided by complex longings and intentions and objectives, even if they are not fully present in our awareness as we work. If any aspect of my art work is not satisfactory, I have learned that very often the resolution of this challenge has little to do with what is going on in the studio. Right now my studio is brimming with work-in-progress for two shops, for an exhibit, and for commissioned work. The ironing board’s set up to prepare hand-dyed silk fabric for felting. 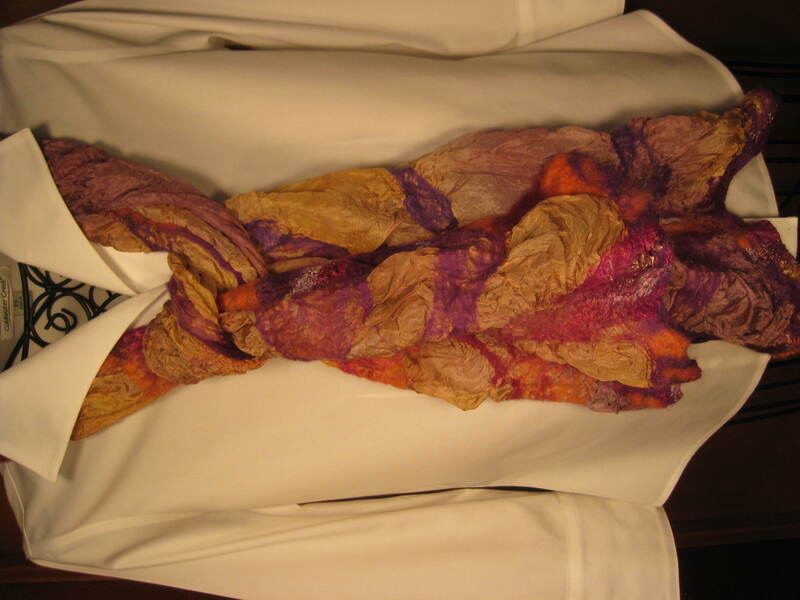 On the work tables, a long and complex nuno scarf is partially laid out. The colors are very subtle: soft pale peach tones mixed with muted greys that become hints of lavender here and there — like last night’s sunset. This scarf is going to take a long time. I think of it as the work I need to do “to get to the other side.” It’s a piece that is designing itself; the colors are the tones needed to somehow balance my creative sensibility. In crafting the fibers all along the edges I’m trying a few new techniques, ideas that have been following me around in my imagination like a puppy. In this work, I’m very aware of how much an awareness of time has dominated my studio decisions in recent days, as I’ve felt obligated to be productive. And while the need to produce can combine with the limitations of time to spark creative and technical leaps, it can also stifle deeper exploration and synthesis and quash creative joy. Balance is always tricky, in whatever occupation we pursue. It’s a luxury to entertain such considerations in one’s work, I know. The trade-off of this luxury includes the fact that artists work long, long hours to bring our work to life. Not all of the work we do will sell, and we live with this uncertainty. Everything shows in our work: our confidence, or lack of confidence; our exquisite joy and abundant lavishing of time in details — or our despair and boredom with repetition. Some of the buzz and energy of artmaking is created because of the continual dialogue between the realities of the need to produce and the longing for transcendence. On the best studio days, these merge. In the studio today, I’ve been working on a new series, “Crystal Torque,” inspired by this summer’s trips to Ireland, and by two gifts: opalescent glass buttons from our daughter, Lizzie; and a beautiful crystal from another dear friend. I’ve covered a work table with three layers of fiber: a bottom layer of dyed merino and on top of this two layers of different shades of natural-colored merino, yak, alpaca and camel. 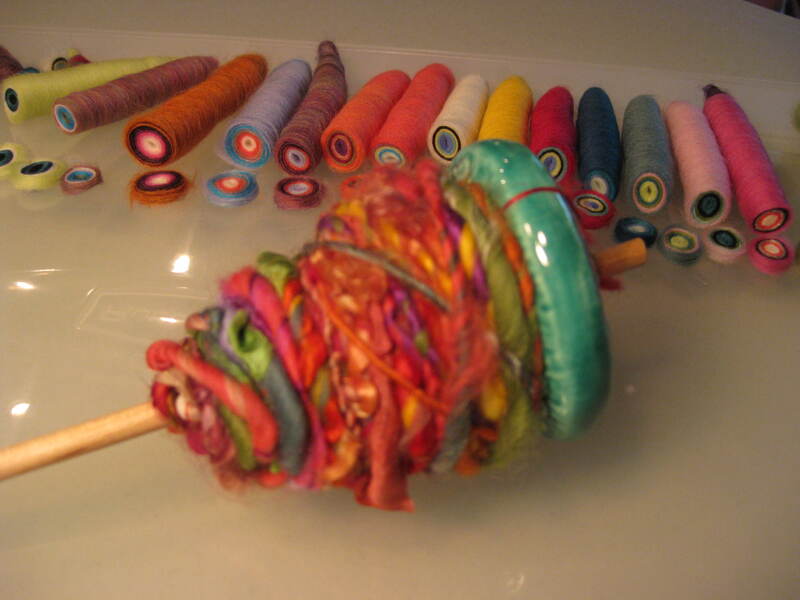 Then I carded and spun a rainbow of merino wool and silk colors into yarn; and deconstructed this yarn, to form spiral “torque” shapes as a design layer. (I thought of the complaint some artists have about having their work copied, and thought to myself “if anyone ELSE is passionate enough to take this sort of time and patience with their work, and aims to copy my process, I would advise them to GO FOR IT! — and improve on it, and please, then, come teach me…”) As I work, the weather changes from misty rain to glimpses of sunshine, and the sky has had the shimmering promise of a rainbow: rainbows in the buttons, rainbows in the crystal, rainbows in the sky, rainbows through my fingers, rainbows up and down my spine and all around. At work in the studio this evening, I felt as if I had lost the trail. I reminded myself that when one is lost it’s a good idea to stay still rather than wander even farther away from where one is wanting to go. I looked at the colors in my work: like fragments of a rainbow, the colors did not make sense — but I was reminded of the colors in a gift from my daughter, colors shimmering in a handful of iridescent glass buttons she’d sent me last year. Without much thought I picked up the buttons from the mirrored surface where I keep them in the studio — next to a similar-sized handful of small gray stones I had collected this summer in Ireland. 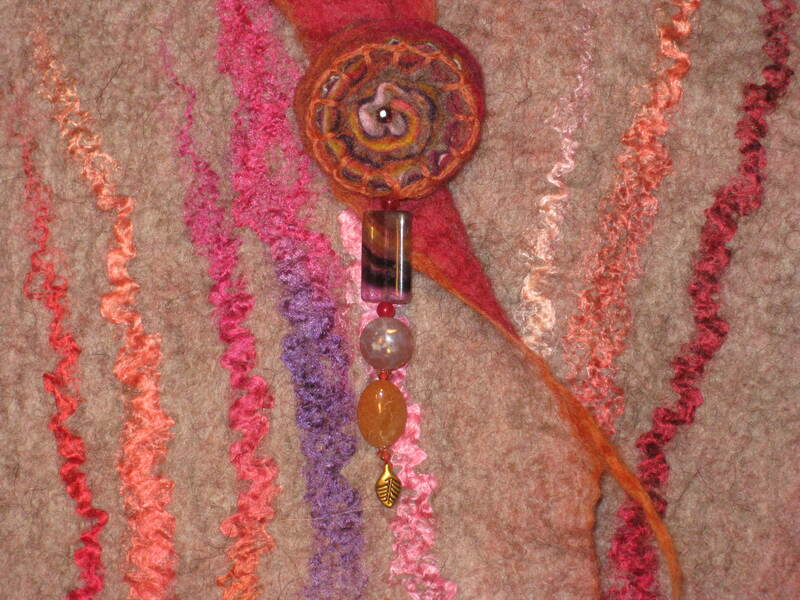 I carried the buttons to the work I had just completed that was drying on a rack, and sure enough the colors matched. When I returned the buttons to the mirrored tray, I instinctively picked up a beautiful crystal I keep near the buttons. The crystal is an element of a sculptural form made for me by a friend. Along with the very intricate crystal (that has additional crystals embedded in it…) the form contains two very different hawk feathers and a beautiful base of weathered wood. 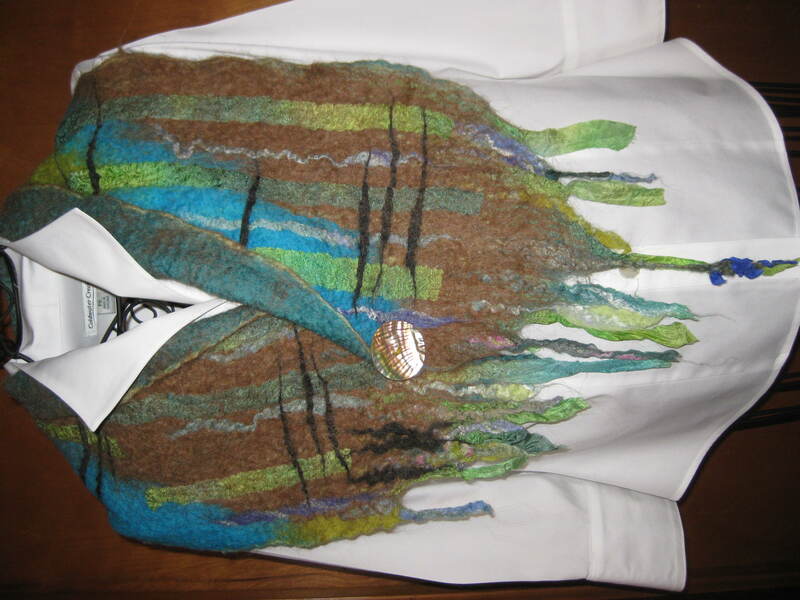 When I held the crystal in the light, I saw the exact same colors shimmering inside it that were in the felted work I had completed, and that were in the buttons I had just held. My sense of having been lost was replaced with a feeling of familiarity, but not a feeling of ease. I may have found the trail again, but that’s just the beginning.